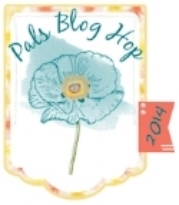 Welcome to the Pals March Blog Hop. This month we are excited to kick-off Spring with our creative projects. We hope you enjoy these creations and we hope Spring finds you soon! You may just be starting the blog hop or may have come from Debra Simonis at Deb's Stampin' Grounds #4 on the Pals Hop. If you get off track at any time, the full lineup below will help you move along from blog to blog so you see all of the amazing creations. It is hard to write about Spring when there is a foot of snow on the ground and more of the “white stuff” projected in the weather forecast. It certainly has seemed like a particularly long winter on the East Coast this year. Spring to me brings a vision of brightness, lighter, cheerful, fun colors and flowers. It also brings that “Happy – just because” kind of feeling. The Sale-A-Bration Sweet Sorbet designer paper incorporates all of the above for me, and when paired with Summer Starfruit, Tangerine Tango and and Pool Party it feels a whole lot less like winter! Next on the blog hop is Goldie Shaul at Punch and Stamp with Goldie # 6 on the hop. Posted on March 11, 2014 by Martie Pollard.